Wii Sports Resort was released in July of this year, and has 169,824 players reporting data so far. Wii Fit Plus was released in October, and has 30,410 players reporting data. New Super Mario Bros. Wii was just released last month, on November 15, and already has 62,152 players reporting data on the Nintendo Channel. Wii Sports Resort's Amazon.com sale rank was #4 and the current selling price is $46.99. 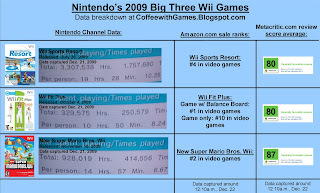 Wii Fit Plus' Amazon.com sale rank was #1(game with board) and #10 for just the software. The current sell price for Wii Fit Plus with Balance Board is $89.99, and the selling price for just the software is $19.96. New Super Mario Bros. Wii's Amazon.com sale rank was #2 and Amazon.com is currently back-ordered on the game, until December 26! The review score averages for the games has stayed the same, only New Super Mario Bros. Wii gained three more review scores, bringing it to 76 "critic" reviews and counting. I actually just tonight, beat the original Super Mario Bros., I downloaded it off the Virtual Console probably more than a year ago, and just tonight sat down and beat it. I can definitely see how the game was a great foundation for Nintendo to build upon for the future Mario games. I also wonder, how many(if any) of the people playing New Super Mario Bros. Wii, never played the original Super Mario Bros., just something I thought about tonight while playing. The same as last week, I'll keep this until the data for Monday, December 28, is updated and I can see if my "prediction" was right. Unless the Nintendo Channel crashes like it did earlier in the year, I'm guessing my prediction will be correct and New Super Mario Bros. Wii will cross one million game-play hours reported on the Nintendo Channel. I'm going to make a guesstimate, and say that New Super Mario Bros. Wii will clock in right around 1,300,000 reported game-play hours on the Nintendo Channel next week. To any of the readers that have already bought and played through New Super Mario Bros. Wii, if you've beaten the game, have you found yourself going back to play it again? Or is one play-through of the game enough for you? If you've beaten it just once, how many hours did it take you to beat? @Coffeewithgames: Was that your first time beating the original Mario Bros? Not a jab, just a question. @ Nicodemus at Nite: No, I had beaten the original on the NES. This was my first time beating it since I downloaded it off the Virtual Console. I'm Bentendo from GN. Anyway! It took me probably six or seven hours to beat Bowser at the end. Of course this also takes into account the fact that I went back and found some of the secret stages beforehand. Anyway, after that I played around a bit more but didn't care to collect the rest of the Star Coins. Do you think that the 14 hours shown on the Nintendo Channel are because people are collecting everything in the game, and also perhaps doing multiple play-throughs with multi-player? *Most people who own a Wii are a part of a family, and I'm sure multiple people play the game separately. *Those same people also play together. *A LOT of people are interested in collecting all the Star Coins so that they can get the ninth world. I was at first but I've gotten to a point in my life where I beat a game and move on to the next one. Most of the time I don't even beat the game anymore. I think it has a lot to do with the quality of games today (once again I'm going on a rant!). Oh and personal correction: It took me six or seven hours until I got to Bowser and beat him. It didn't take that long to actually beat him! Same here I am not motivated to collect the rest of the Star Coins. Woah 10 hours what did you do walk thru each stage and jump on the flag pole at the last second. I beat it in like 3 hours. @Mariomaniac: 3 hours!? That's crazy. Do you think you'll go back and play it anymore? Yes I will play it with my sister and I will play the Bowser battle over and over again. but I will not get all the star coins. I found that part of the game boring. When I said 3 hours I meant beat it from World 1 to Bowser. I beat it in 1 sitting. @Mariomanic45213: What Bowser battle? Are you just referring to the last part or something else? Finding all the star coins to me is the whole point for core gamers. Some of them are hidden in very dubious places and finally finding them is very rewarding. Not to mention that those of you not bothering to find them won't get to experience the extra challenge of World 9 which is basically for core gamers to test their platforming skills.